Ringtail Cardinalfishes, Ostorhinchus aureus, excellent shoaling species for a reef aquarium. Image: Scott W. Michael. Editor: Readers are invited to leave comments about their own experiences in keeping different species of shoaling and schooling fishes. Entries may quoted in CORAL Magazine. One of the most spectacular sights on a reef is a cloud of fish hovering, as if in flight formation, over the canopy of the coral forest below. In many cases, the piscine collective moves like a large, autonomous organism; this illusion is achieved by the intricate, coordinated movements of the members of the group. Watching such a fish group can be a truly mesmerizing experience! Not only is a cohesive group of colorful fish a magical thing to watch in nature, but an aesthetically pleasing piscine passel also makes a dramatic statement in the marine aquarium. Watching a harmonious group of conspecifics interacting is more enjoyable than observing an artificial circus made up of lone members of gregarious species. Only in groups that mirror nature do many of the most fascinating social behaviors emerge. In fact, there are many group-forming fishes that do not thrive and even pine away if kept on their own. Selecting fish species that will form harmonious groups in your home aquarium can be challenging. As aquarists try harder to mimic wild coral reefs, finding species that configure themselves into schools or shoals in the aquarium become a challenge. Just because a group of fishes lives together amicably in the wild, that does not mean they will do the same within the borders set by a glass box. Here we will examine some fish species that readily form groups in the home aquarium. Laypeople are quick to use the term “school” to describe any group of fishes, but not every fish assemblage is truly a school. Even conspecific gatherings of fish of the same species may not fit the proper definition of a school. Fish groups can be broken down into several different categories: schools (or polarized schools), shoals (or non-polarized schools), and aggregations, harems, or colonies. A school comprises individuals of a similar size that usually maintain an equal inter-individual distance and move synchronously with one another. In some schooling species the movements are so well coordinated that the group does look like a single large organism moving through the water. Herrings, sprats, and sardines are all examples of fish species that normally occur in true polarized schools. Some fishes form temporary schools when they move from one location to another or when feeding away from the reef. For example, Creole Wrasses (Clepticus parrae) sometimes form immense schools as they travel from daytime feeding areas to spawning sites on the reef. In a true school, all members occupy a similar social status—that is, they are an egalitarian collective. There are few true schoolers that do well in the home aquarium. A shoal is comprised of a group of fishes whose members do not stay an equal distance apart (at least most of the time) and do not always engage in coordinated movements. In both schools and shoals there is social attraction between the individual members. For example, most of the reef-dwelling Anthias and many Chromis species form shoals. There are also a number of damselfishes that do not aggregate when feeding near the substrate, but form shoals when they move into the water column to feed because they are more vulnerable to predators when they leave the protection of the reef. In shoals, the social status of individuals is usually not equal. Typically a hierarchy, or even social units, exist within the shoal. For example, in Anthias species males are dominant over females, and each male defends a group of females within the shoal. There are many shoalers available to home aquarists, but because not every individual in the group has an equal social status, keeping them together can be difficult. An aggregation or colony is an assemblage of fishes brought together by an environmental stimulus, not by a desire to be together. For example, a cave, a large host invertebrate (e.g., a sea anemone or sea urchin), or a food source may attract an aggregation of one or more species. An aggregation can be comprised of individuals of different sizes and even different species, and the members of this type of group usually mill around the mutually attractive stimulus and do not carry out coordinated movements. For example, a number of fishes form mixed-species feeding aggregations, some gather around a cleaning station, and some nocturnal forms cluster under overhangs or in caves. One thing you should be aware of is that fishes usually form shoals and schools in the wild as a form of protection. There is safety in numbers. It may be that some species that normally form cohesive groups in the wild do not do the same in captivity because they learn that predators are in short supply in their new captive crib. As a result, they no longer have to depend on each other to reduce the likelihood of being eaten, so other natural instincts, like feeding, become more important and group unity breaks down. No, I would not encourage you to add a Coral Grouper to your cardinalfish tank in order to encourage shoaling, but this may explain the differences in behavior between captive and wild populations. Food availability and water movement can also have an impact on schooling or shoaling. For example, many Anthias species form much looser groups when current flow diminishes. Now that you know some of the ground rules and terminology, we can talk about some schooling, shoaling, and group-forming fishes that may work in your home aquarium. This is not an exhaustive list, and readers are invited to add to or comment on it (see the online version of this story on the CORAL website). Let’s start with a relative newcomer on the scene. Probably the best-known shoaling reef fishes belong to the damselfish genus Chromis, which happens to be the largest damselfish genus with 97 described species. Most members of the genus differ from other damsels, not only in their form but also in their behavior. Many are found in large shoals (sometimes numbering in the thousands), which swim above the reef, facing into the current to capture passing zooplankton. (The term “living curtain” has been used to describe large shoals of Chromis.) They are more streamlined than many of their confamilials and have deeply forked tails. Both of these characteristics are adaptations that make them more “fleet of fin”—an attribute that is important to these fishes because many Chromis spp. spend lots of time well away from shelter. They also have papillae at the back and bottom edges of the eye’s orbit. These so-called orbital papillae are also present in other zooplanktivores, including certain anthias and the Fusilier Damsel, Lepidozygous tapeinosoma, another shoaling pomacentrid. These small structures are thought to reduce turbulence as the fishes swim through the water, increasing their hydrodynamic efficiency. The two species that are best known to aquarists are the Blackaxil Chromis (Chromis atripectoralis) and the Bluegreen Chromis (C. viridis). Both reach a length of around 4 inches (10 cm) and are blue-green to metallic green overall. The Blackaxil Chromis can be easily distinguished from the similar C. viridis by the dark spot on the pectoral fin axil. These damsels form small to very large shoals that swim fairly high above the substrate. The two species sometimes even form mixed feeding groups, ingesting planktonic crustaceans (especially copepods, mysids, and shrimp larvae), fish eggs, and algae. One of the characteristics that make these two species the most desirable damselfishes is that they are relatively passive (at least for a pomacentrid). Unlike most others in the family, many of these Chromis spp. can be kept in groups in a moderate-sized tank (100 gallons/380 L) or more). In longer tanks, at least 6 feet (1.8 m) end to end, Chromis are more likely to form into schools, racing together in aggregations that offer an exciting display. Group members do tend to form a dominance hierarchy (pecking order), with subordinate members often receiving an unequal share of maltreatment from their conspecific tankmates. But if the Chromis group is large enough, the aggression is diffused and no one subordinate gets too much abuse. It is best to keep a minimum of six, but groups of 10 to 12 are even more likely to thrive. If you house them in a smaller group, the subordinates may hide continually and never come out to feed because of the harassment they are subjected to. The dominant fish will keep harassing the subordinates until it is the only one left! Of course, the size of the tank also determines how large your Chromis shoal can be. Another desirable Chromis characteristic is that they spend most of their time in the upper layers of the aquarium. Not only is this aesthetically appealing, but in the case of the other, more active “schoolers,” like the flagtails and fusiliers, they can also act as dither fishes. Many reef fishes tune in to the activity of their neighbors to determine if it is safe to come out of hiding. By swimming about in the open water, dither fishes reassure these shyer species that it is OK to venture into the open. One negative Chromis characteristic is that they tend to be less durable than some of the other damsels. For example, they can be more susceptible to disease (in particular Uronema, which manifests as red lesions on the body) and are more likely to be mistreated by aggressive tankmates. Quarantine these damsels upon acquisition and be prepared to treat them with formalin prophylactically to reduce the likelihood of Uronema infections. Feed your Chromis a varied diet that includes color-enhancing foods. Juveniles of some of the Chromis species tend to acclimate more readily than the adults. All the Chromis species are great for the reef aquarium, as they are not a threat to any ornamental invertebrates. One species that has burst onto the marine fish scene in the last five years or so is the Barred Flagtail (Kuhlia mugil). This species is a member of the family Kuhlidae, a group characterized by a laterally compressed body, a forked tail, a deeply notched dorsal fin, and relatively large eyes. Members of the family normally feed on small crustaceans, fishes, and insects on the water’s surface. At least some species do most of their hunting after dark. The members of this family range from marine to entirely freshwater; a number of species regularly move from full seawater to hyposaline conditions. The Barred Flagtail is a marine species, but there are reports of juveniles being taken in full freshwater. While the Barred Flagtail is not the most striking fish in the sea, it does form schools in the home aquarium. This fish is silver with black bands on the tail, and a group of them in an appropriate-sized aquarium can add great interest. It is very hardy and rarely succumbs to disease. The Barred Flagtail is primarily nocturnal, feeding after dark on small, free-swimming crustaceans. In the aquarium, it readily takes food during the day and will eat almost anything. While they are not aggressive toward other fishes, Barred Flagtails are voracious feeders and may intimidate fishes that are less boisterous and more retiring in nature. Flagtails tend not to be targeted regularly by pugnacious tankmates, but I have seen juveniles fall prey to piscivorous species (e.g., groupers, snappers). The biggest drawback to the species is their size—they can get almost 10 inches (25 cm) long, so a group of five or six would need to be housed in a tank that holds at least 240 gallons (910 L). Even in a tank this large they would be rather cramped, as they are very active. Another very appealing group of schooling species for the larger aquarium is the fusiliers. The fusiliers were once included with the snappers, but now the 20-odd species are placed in the family Caesionidae. These fishes are specialized zooplankton feeders. Their streamlined form and forked tail hint at their ability to swim fast, and they are as active as they are sleek. In nature they tend to occur in schools that can be very large. While hobbyists once had little access to these fishes, now they are not uncommon in some aquarium stores. The fusiliers comprise a family that consists of approximately 23 species that are placed in four genera. Fusiliers were once thought to be members of the family Lutjanidae and were placed in the subfamily Caesioninae. But based on differences in the jawbones of the snappers and fusiliers and an anatomical specialization related to the zooplankton feeding habits of the latter, this subfamily has since been elevated to family status: the Caesionidae. The fusiliers possess several anatomical adaptations that aid in feeding on small planktonic prey. They do not need the numerous strong teeth that the lutjanids have. Hence, their dentition is comprised of smaller, weaker teeth, and some species lack teeth on certain elements of the jaws (e.g., the vomer, palatines, and premaxillary). The jaws are also located on the end of the head (i.e., terminal) and are highly protrusible—further adaptations to a zooplanktivorous lifestyle. Another adaptation to their zooplankton-feeding lifestyle is their more slender, fusiform shape and their forked tails. These characteristics are indicative of a fish that is built for speed. They need to be fast because they spend much of their time well away from the protection of the coral reef. In order to avoid predators, most fusiliers form schools that can be quite large (hundreds of individuals) and may consist of more than one fusilier species. Many fusiliers are brightly colored, and the majority sport one or more stripes that run down the sides of the body. When the fish are schooling, these markings may serve to further confuse a potential predator’s search image. But even with all of these defensive adaptations, fusiliers still fall prey to groupers, snappers, and jacks on occasion. When the risk of predation is low and food is abundant, fusilier schools break up and individuals start to dart about, capturing zooplankters. Schools of fusiliers also break up when they are in proximity to cleaning stations. Individuals hover near the stations to be inspected and groomed. Some species change colors, apparently so that the cleaner fishes servicing them can locate ectoparasites more easily. The fusiliers tend to prefer current-prone reef zones like reef channels, outer reef faces, and outer slopes. At night they sleep on or in the reef infrastructure. Some species undergo dramatic nocturnal color changes. These same colors are often displayed in captive individuals that are stressed. Although they were once hard to find on marine wholesaler price lists, the fusiliers are becoming more common in aquarium stores. The biggest drawback to keeping fusiliers is that the adults need to be housed in a very large tank—300 gallons (1,136 L) or bigger. They should also be fed often (it is best to provide food at least three times a day) and be housed in a tank with lots of unobstructed swimming room. Be aware that these fishes are prone to leaping out of open aquariums or colliding with décor or the aquarium sides when frightened by an aquarist’s hand, an overly aggressive fish, or a sudden change in lighting. The fusiliers are not as aggressive as their snapper relatives and can be kept with a wide range of fish tankmates. It is best to avoid housing them with species that are bite-sized, as they may occasionally swallow smaller neighbors. Fusiliers do not always form nice schools in the confines of an aquarium, as they do in the current-prone, predator-rich areas where they naturally dwell. In the aquarium they often do more milling about than schooling, which may not be the effect you are trying to achieve. However, if you have strong water flow from one direction they are more likely to school, at least some of the time. There are a handful of species that are regularly making it into the aquarium trade. One of the most common of these is the Bluestreak Fusilier (Pterocaesio tile). This fish attains a length of about 10 inches (25 cm), and large adults do best in a tank that holds at least 240 gallons (910 L). While they can be kept with sessile invertebrates, they may eat ornamental shrimps and will snap up any fish small enough to swallow that shares the water column with them. The Blue and Yellow Fusilier (Caesio teres) is an even more spectacular species. It is deeper-bodied and has a blue body and a yellow tail. It is a large species, reaching a maximum of around 16 inches (41 cm), so it requires an even bigger tank (8 feet/2.5 m is the minimum length for adults). Of course, if you want to keep a school of these fish you will need a very big aquarium (500 gallons/1,893 L or more for adults). The Blue and Yellow Fusiliers often pose for cleaner wrasses (Labroides spp.) in the wild and will also do so in the aquarium. The fusilier remains motionless while the wrasse picks the insides of its mouth, its gills, and the surface of its body. Some species even engage in some color change, which may help the cleaners see the parasites. The cardinalfishes (Apogonidae) make up one of the largest families of fishes on tropical coral reefs, with 22 genera and approximately 346 species. They are important predators of zooplankton and benthic invertebrates, as well as principal prey for the many piscivores that lurk in the world’s reefs, bays, and lagoons. A number of the apogonids are attractively colored and hardy and can be counted on to behave well in a fish-only tank or a reef aquarium. Most are also relatively small, attaining a maximum length of less than 4 inches (10 cm). Many of the cardinalfishes form groups of some sort. Most shoal or aggregate—fewer form true schools. While this may be the case in the wild, not all species are as tolerant of conspecifics in aquarium confines. Take, for example, the ever-popular Banggai Cardinalfish (Pterapogon kauderni). These fish often aggregate around a refuge in the wild (sometimes in the hundreds), but if an adult male and female form a pair in the aquarium, they are likely to torment their conspecific neighbors. If you want to keep a group of cardinalfishes together, pick the species carefully—that is, make sure you select a known captive shoaler. It is also best to house your group in at least a moderate-sized tank (75 gallons/284 L or larger) that contains plenty of hiding places. Some species can be housed together in smaller tanks (e.g., the Redspot Cardinalfish, discussed below), but even in some of these cardinalfishes a dominance hierarchy may form. It is often advantageous to keep at least six individuals, as this will help prevent any one member of a group from being picked on excessively. More and more aquarists are keeping even larger aggregations—12 to 20 or more in a large reef aquarium make an impressive spectacle. Juvenile cardinalfishes tend to be more tolerant of each other than adults. As mentioned above, if adult individuals form a bonded male-female pair, they may become intolerant of conspecifics. If this happens, either the pair or the other members of that particular species have to be separated. Be aware that some cardinalfish pairs not only pick on conspecifics, they also behave aggressively toward other apogonids. Cardinalfishes do not tend to pick on unrelated fishes. They may defend a preferred hiding place from other secretive species, but most tend to be rather docile. One of the best shoal-forming apogonids is the Bluestreak or Threadfin Cardinalfish, Zoramia leptacantha (most of the other members of the genus Zoramia also form groups). This is a smaller species (2.4 inches/6 cm long) that has a long filament on the first dorsal fin, blue eyes, and blue streaks surrounded by patches of orange on the sides of the body. Groups of these fish typically hang above branching stony corals (classically Acropora spp., branching Montipora spp., and Porites cylindrica). Shoals comprised of 2,000 or more A. leptacanthus are commonly encountered, and one researcher reports seeing a shoal that consisted of over 24,000 individuals! At night, this cardinalfish disperses over adjacent sand substrates to feed on crab larvae, but it is also known to consume some zooplankton during the day. They return to their diurnal haunts before dawn. This species is a welcome addition to a reef aquarium. It should be kept in groups consisting of five to seven individuals or more, and should never be housed with highly pugnacious tankmates. It is not a threat to other fishes or to ornamental crustaceans. night, but at night they often move up to 20 feet from their daytime hideouts to feed. They do best in captivity if housed in groups and can be trained to accept aquarium fare when the lights are on. They should not be placed in a tank with aggressive fishes, as they tend to be picked on. Two attractive species in this genus (which look somewhat like freshwater tetra species) are highly regarded aquarium shoalers. The Twinspot Cardinalfish (Taeniamia biguttata) reaches a length of 3.4 inches/8.6 cm (some sources suggest they get bigger than this) and has a black spot just over its gill cover and one just in front of the caudal fin, as well as a black band under each eye. Usually there are fine orange lines on the sides of the body and caudal peduncle. This cardinalfish normally lives in dense shoals at the entrances of caves or among branching corals. The Blackbelted (a.k.a. Girdled) Cardinalfish (Taeniamia zosterophora) is equally desirable. The Twinspot Cardinalfish reaches a length of 3.1 inches (7.8 cm) and is easily identified by the two red lines behind the eyes and the wide black band under the second dorsal fin. (The colors of T. zosterophora are even more intense during spawning.) This species forms dense shoals over heads of Acropora spp. and Porites cylindrica. It also forms groups near the entrances of caves or among black coral trees. There are a number of cardinalfishes in the genus Ostorhinchus that form aggregations or shoals. Many of these are mutually attracted to a hiding place, like a stony coral colony, a sea anemone, or a sea urchin. Some of these species do not typically like to hang out together in the aquarium. 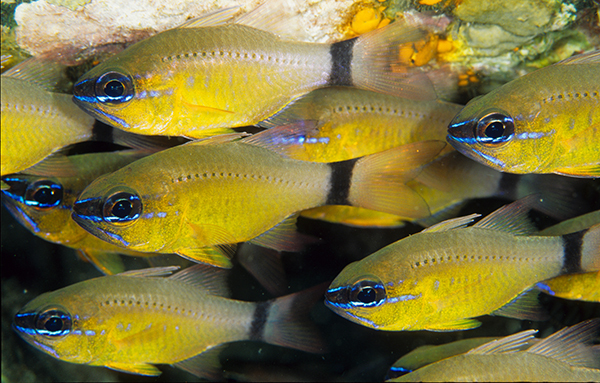 One species that does do well in groups is the Redspot Cardinalfish (Ostorhinchus parvula). This is a small (1.6 inches/4 cm in total length), attractive species that sports a bright red spot on the caudal peduncle. It tends to occur in large, mid-water shoals in the wild. The only problem with these fish is that they do not ship well, and if they are not given special care once they get to a wholesaler/retailer they break down quickly. That said, if you can get some conditioned individuals from a good supplier, they tend to do well. Feed them several times a day—frozen Cyclops make a great food. Be aware that these small apogonids are often targeted by more aggressive tankmates, so select their neighbors carefully and always keep them in groups—in their case the more, the merrier! Another interesting O. parvula characteristic is that it prefers open water—that is, it tends to hang in mid-water rather than skulk about the rockwork as some cardinalfishes do. Another good Ostorhinchus shoaler is the Frostfin Cardinalfish (O. hoevenii). Unfortunately, this species is not common in the trade, even though it is handsome, peace-loving, and relatively durable. In the wild, groups of them are often found hovering over sea urchins, long-tentacled plate corals, Elegance Corals, or sea anemones. It gets 2 inches (5 cm) long and has diagnostic white trim along the rear edge of the first dorsal fin. If we look at the usual guild of shoaling species available in the aquarium trade, some of the often-overlooked but most interesting members of this guild are the dartfishes. These are peace-loving fishes that do best if kept in groups, and I believe that there are few fishes more interesting in the reef aquarium than a group of five or more Zebra Dartfish (Ptereleotris zebra). Groups of these fish dance about in the water column, spreading their fins and curious chin barbels and intensifying their color as they display toward one another. The Spottail Dartfish (Ptereleotris heteroptera) and the Green Dartfish (P. microlepis) also make great aquarium shoalers. These dartfishes do best with other pacificators and need a deep substrate with some burrows in which to dive if threatened. While the related firefishes (Nemateleotris spp.) are sometimes seen in groups in the wild, they tend to beat the tar out of each other in the aquarium, especially if they are crowded. They are best kept in heterosexual pairs unless you have a very large reef system. This is Part 1 of a survey of some reef fishes that will form groups in the home aquarium. As we have said, relatively few species form true “schools” that would be recognized as such by ichthyologists and can be kept in a typical home-scale aquarium. 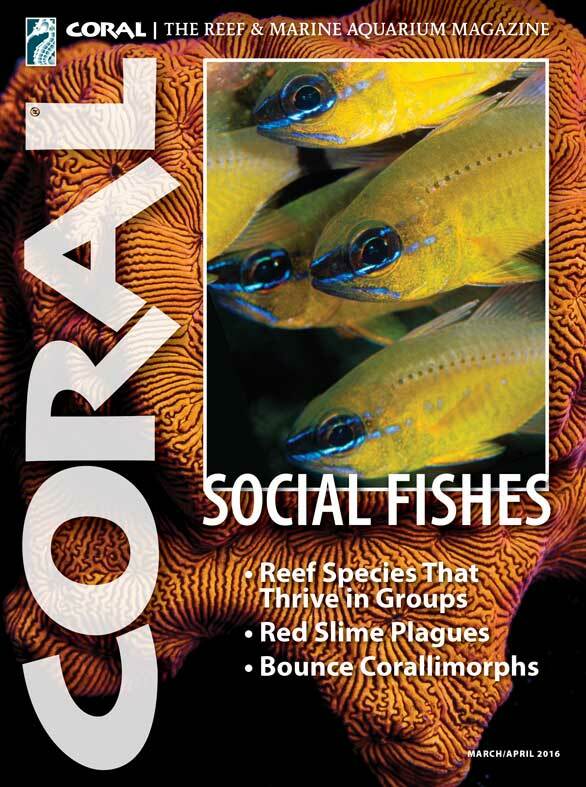 When we open up the scope to include fishes that live in colonies and harems and other social groupings, there are many, many more, and we will continue to explore your choices in the next issue of CORAL. Remember that the flagtails and fusiliers must be housed in larger reef aquariums (200 gallons/757 L or more), while many of the cardinalfishes we have discussed and the “green” Chromis can be kept in more moderate-sized vessels. Choices of nano-scale fish species that can be kept successfully in groups are more limited, but the number is growing, led by some fascinating gobies, blennies, dwarf cardinalfishes, and others. There are certainly other reef fishes that can be kept in captive aggregations, shoals, or schools, but remember: just because they happily live in groups in the wild does not mean that they will form serene assemblages in the limited confines of the predator-free exhibit. 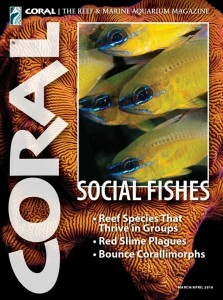 Scott W. Michael is author of the PocketExpert Guide to Reef Aquarium Fishes, the Reef Fishes series, and other titles. He is a CORAL senior contributor and lives and keeps aquariums in Lincoln, Nebraska. Great write up I have been trying to find some Taeniamia zosterophora and this is the only information I could find on them. Have you ever seen them available or know what the going price for them would be? Thanks again.